Ganesha Chaturthi – the festival which celebrates the greatness of the harbinger of all things good – Lord Ganesha, is now on the verge of completion. This year, the grand occasion of Anant Chaturdashi falls on the 5th September, 2017, Tuesday. The process of the Ganesh Visarjan or bidding adieu to the great Lord is done with as much fanfare and spirit, as the Ganesha Pooja is done. But yes, there is one thing in common – almost everyone's heart is a bit heavy on this day, as there is a nostalgic and emotional feeling about the elephant God going away from us. We at GaneshaSpeaks.com hope that you enjoyed the vibrant festival of Ganesh Chaturthi with your friends and family. In this article, we present some information about the Ganesh Visarjan process and also about the powerful day of Anant Chaturdashi. Read !!br0ken!! Is there any specific date and time for Ganesh Visarjan? There are no strict rules; usually the Ganesh Visarjan ceremony depends on the family tradition. Symbolically, Lord Ganesha comes home on the auspicious day of Ganesh Chaturthi and it is up to us to decide when we want to give Lord Ganesha the farewell. But, it is considered best to immerse the idol before the Sunset. Lord Ganesha may be going away this Anant Chaturdashi, but you can seek his blessings throughout the year by purchasing the wonderful Ganesha Idol Attuned by Bejan Daruwalla ! There are no specific Ganesh Visarjan mantras. “Ganapati Bappa Moriya” is the most common chant that beautifully defines the spirit of Ganeshotsav. How should you Perform Ganesh Visarjan Procedure? Perform Aarti before Ganesha Visarjan. Be present with all the family members. The traditional Ganesh Mantras and the Aarti prayers should be chanted. Start the Ganesh Visarjan day with Morning Aarti. Sing the “Jai Ganesh Deva” chants while performing Aartis. Distribute holy Prasad among all the family members. Offer five items – Oil lamps, Flowers, Incense, Fragrance and well-prepared delicacies to Lord Ganpati. When it is time for Ganesh Visarjan, the family members should gather once again to perform Aarti before leaving the house. Five minutes prior to leaving the house, move the idol very slowly and slightly, about 1 inch forward. In short, you have to change the position of the idol a bit, which marks the completion of the Lord's stay at your place. It is important to take Him for Visarjan with all family members. Be grateful to Lord Ganesha for visiting your home and convey your heart's message to the Lord. Thank him for bringing prosperity and auspiciousness to your home. Thank him for taking away all difficulties with him. Gratitude is what matters the most to the Lord. Sprinkle raw rice mixed with turmeric (Akshat) upon the lord. Spoonfeed curd to Ganesha as a remembrance. Take a red cloth, keep dry coconut stuffed with jaggery and 5 different grains (including rice). Tie it in a knot around Ganesha’s hand. This is the food prepared for His journey. Take some water and sprinkle it on the person performing the Ganesh Visarjan. Pick up the Ganesh idol and take Him around the House, mainly the master bedrooms and the kitchen so that His Holy Gaze and Blessings fall on the full house. Chant “Ganapati Bappa Moriya” and other Ganesha shlokas. Walk out of home and move towards the immersion point. Take a Coconut and circle on the head of the Idol three times and break the coconut on the ground and leave it aside. Don’t take this as a prasad rather immerse it with the idol. Once done, family members can proceed to the Ganesh Visarjan area, where once again the Aartis should be performed before finally letting Him go. The person performing the Ganesh Visarjan should remove all garlands and other decorations on the Ganesha idol. Do not throw the removed garlands and decorations in the river. You can dispose or donate them at the appropriate place. Now, immerse the idol of Lord Ganesha. His Blessings will remain with you and your family and He will take away all pains and problems and bless you with Peace, Prosperity and Health. 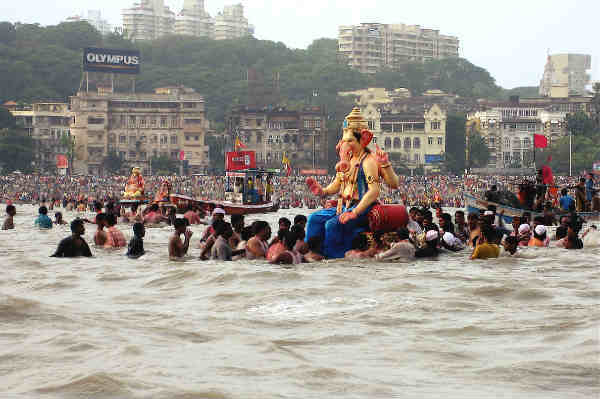 What you should immerse and what you should take back with you after the Ganesh Visarjan? What If you Wish to Bring Ganpati Home Next Year? 1. Sand near the immersion site. Ganesha wishes a happy, healthy and prosperous Anant Chaturdashi. This Ganeshotsav, bring home the auspicious Ganesha Idol Attuned by Bejan Daruwalla in order to live a happy, healthy, wealthy and peaceful life.